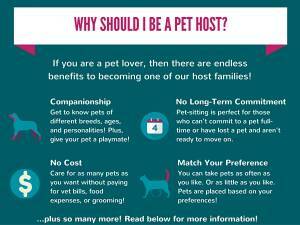 Why should you become a pet sitter? Pets are pre-screened and matched to host’s family and lifestyle (If children or other pets, the visiting pet will be selected with these criteria in mind. Number of hours people are out of the house will also be taken into consideration. Pets Are Inn is looking for responsible animal lovers to care for pets while their owners are away. Each pet sitter will be thoroughly interviewed. We will ask you what pets you have owned, your pet preference, and the amount of time you spend at home. If you have a cat or pet, we will not put a cat in your home. You will also need to pass a home inspection.